Atoms are made up of three essential particles – protons (+ charge), neutrons (no charge), and electrons (- charge). These three particles orbit each other to create a nucleus, which lies at the centre of the atom. 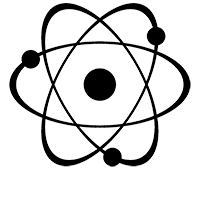 An atom’s nucleus usually has as many electrons as protons, and has as many neutrons as protons. Adding a proton makes a new kind of atom. Neutrons turn atoms into isotopes (a heavier version of the atom). Some isotopes are unstable and tend to decay into other elements, giving off subatomic particles or radiation; these are radioactive and are known as radioisotopes.